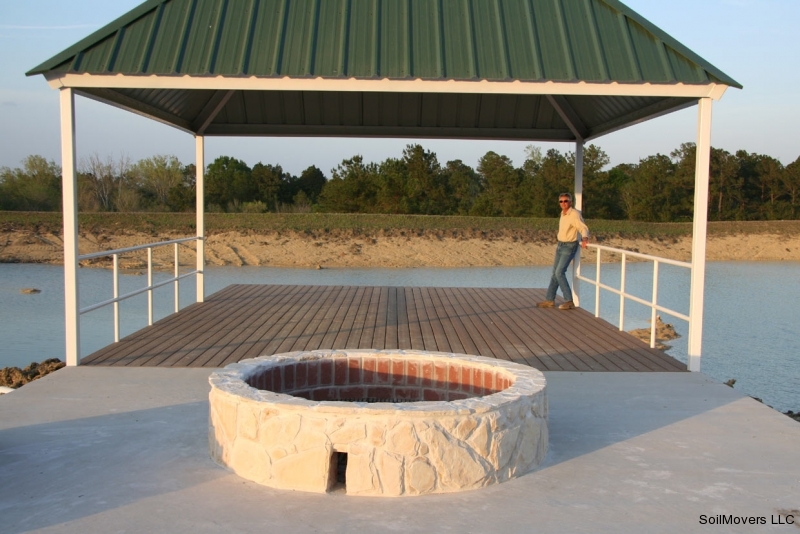 Another one of those A to Z projects that we enjoy. 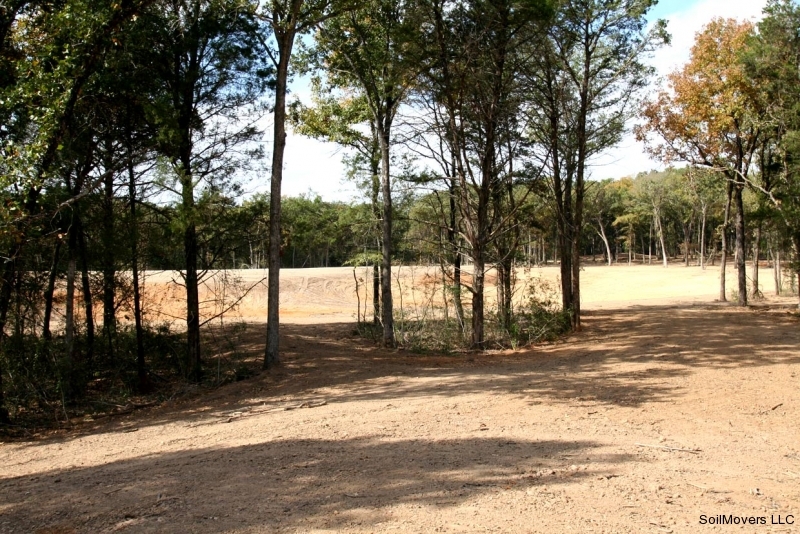 A 70 acre tract with no improvements. 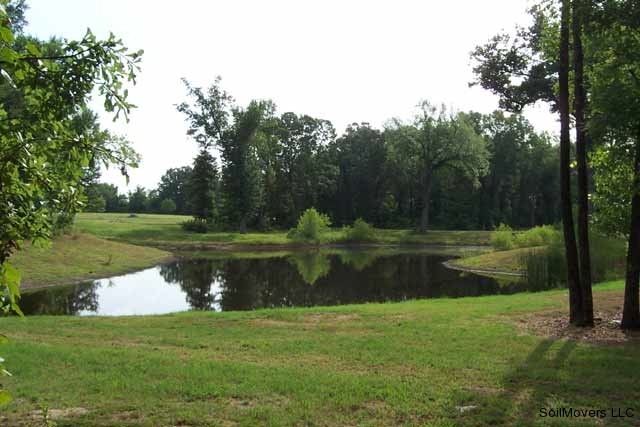 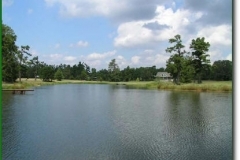 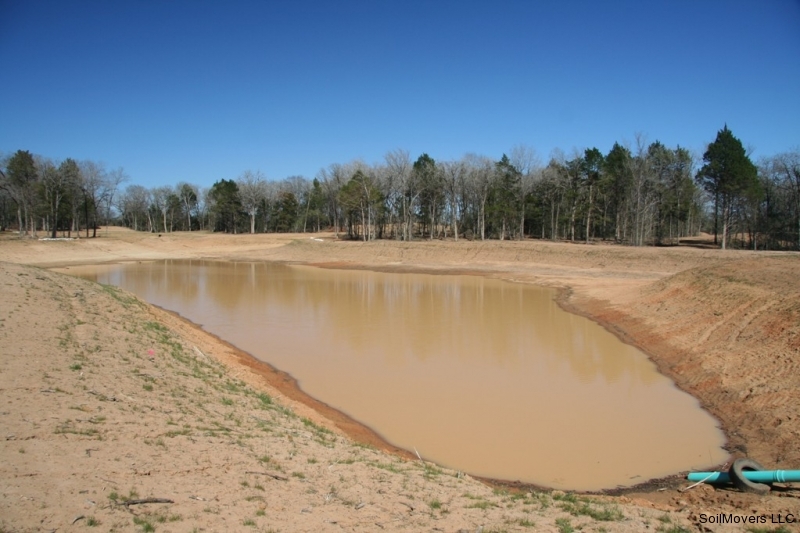 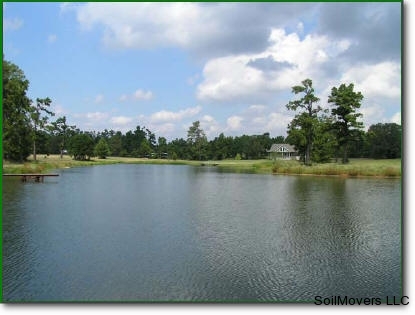 The owner is asking for a large lake with a plastic liner, renovation of a small pond that leaks. 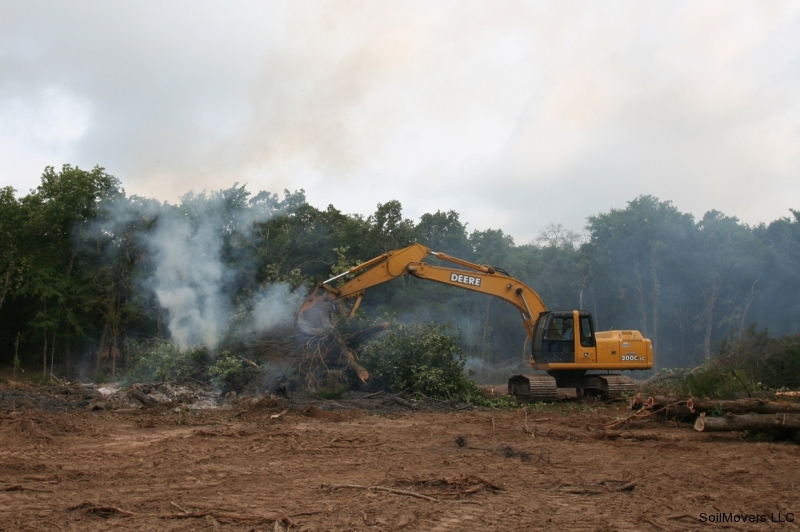 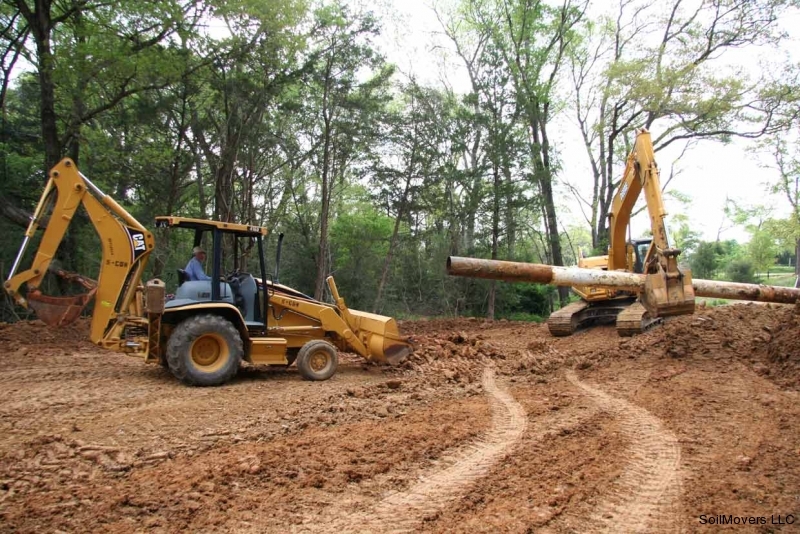 roads, brush clearing, infrastructure and preparations for a future home site. 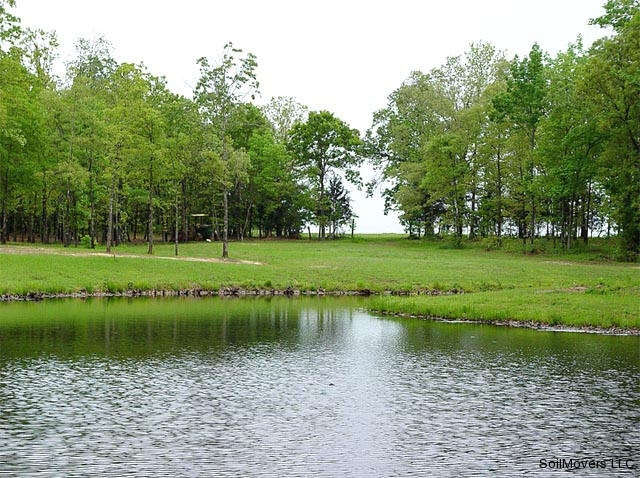 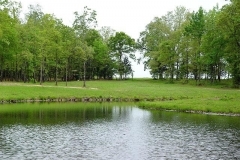 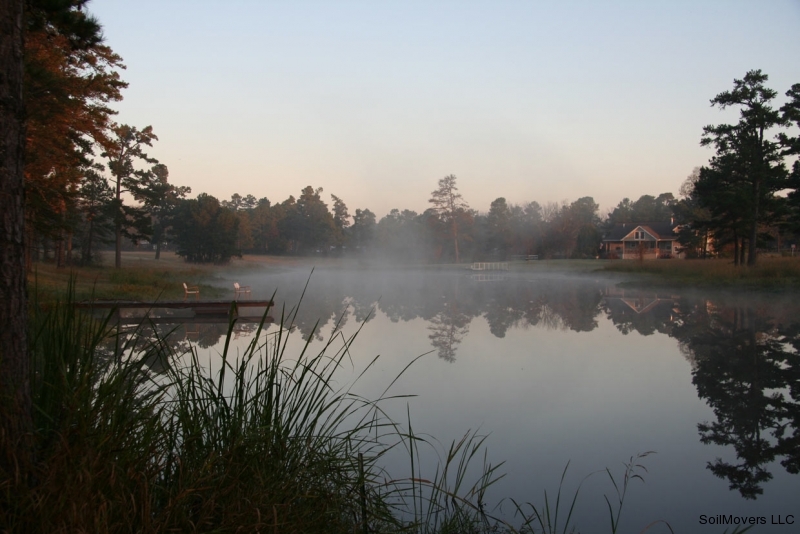 The land owner wants a complete rural lake retreat as his retirement residence. 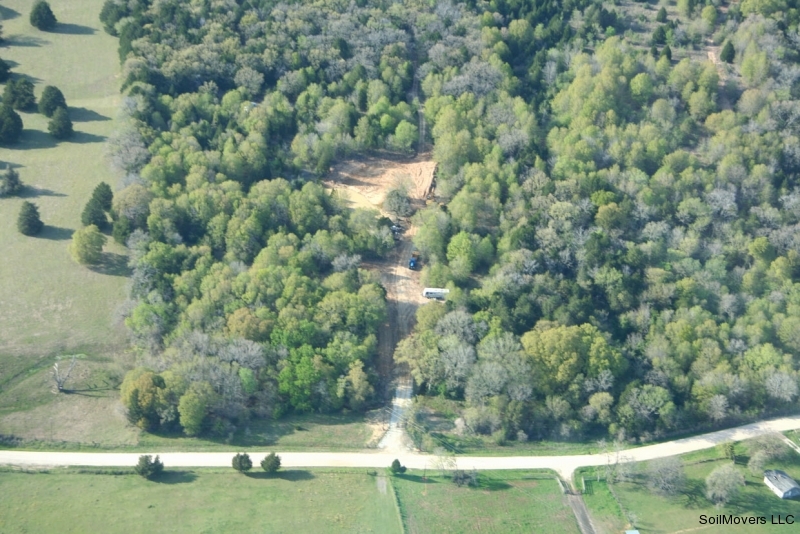 Aerial view of entrance prior to start of construction. 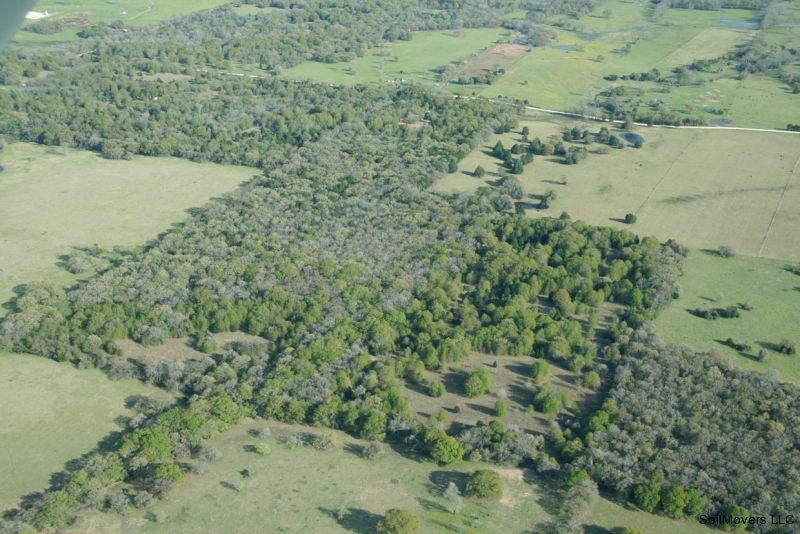 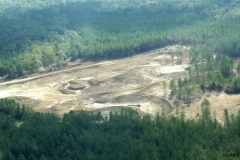 Aerial view of proposed lake site which is the heavily wooded area in the center of the photo. First step is to clear trails and do soil testing to see if the soil is suitable. 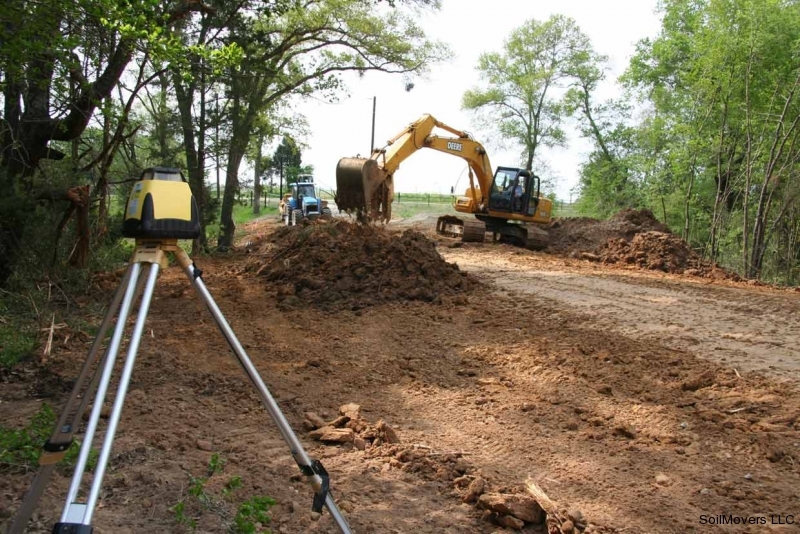 When the area is opened up, features are often discovered that are incorporated into the plans. 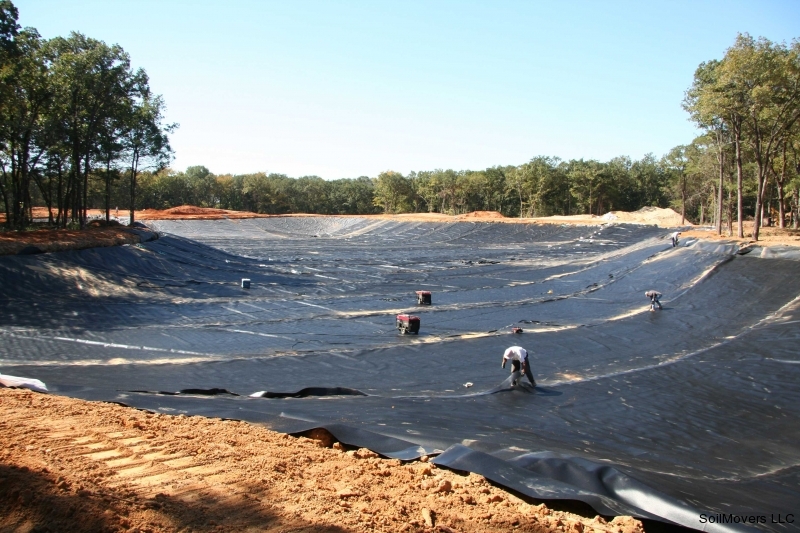 With one failed lake on the property, Nick soil tests over and over to make sure the extra expense of a plastic lake liner is necessary. 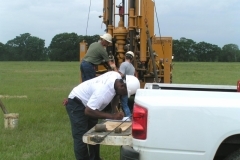 More soil testing. 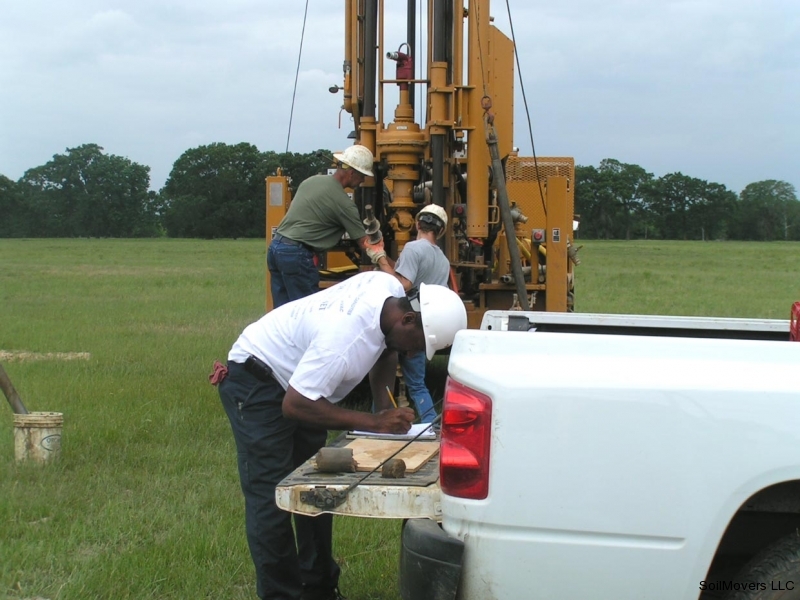 Do it right the first time! 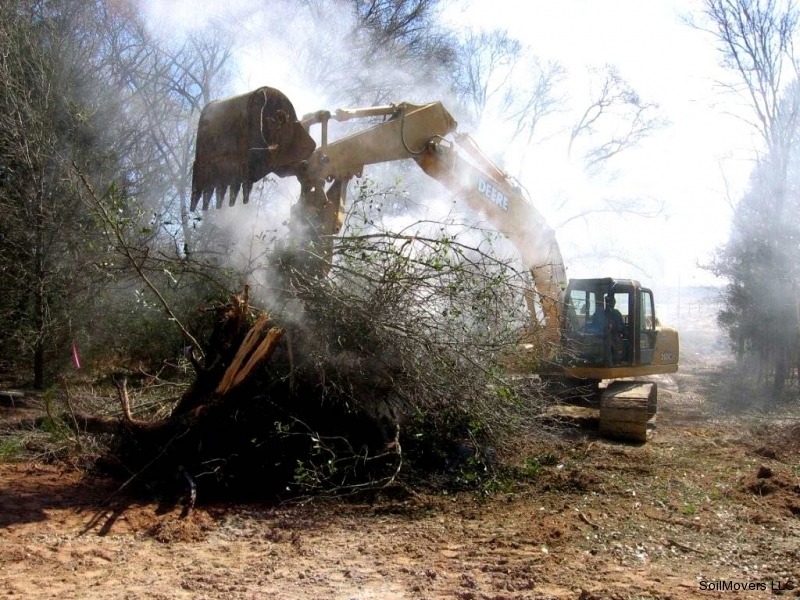 Wet winter weather affords the opportunity to burn brush. 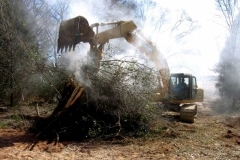 Brush is never burned during unfavorable conditions or without client approval. 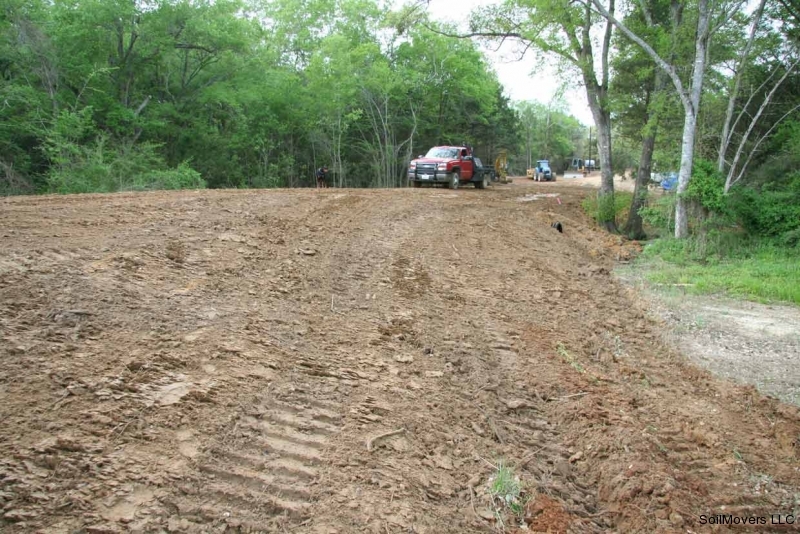 The existing driveway is completely redone because it was incorrectly done to begin with and has been a source of constant frustration for the land owner. 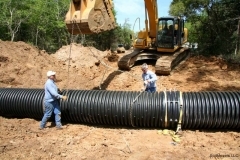 Inadequate original driveway is refurbished with larger drainage pipes. 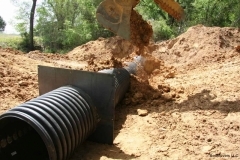 Soil corrections were needed around the pipe as well. 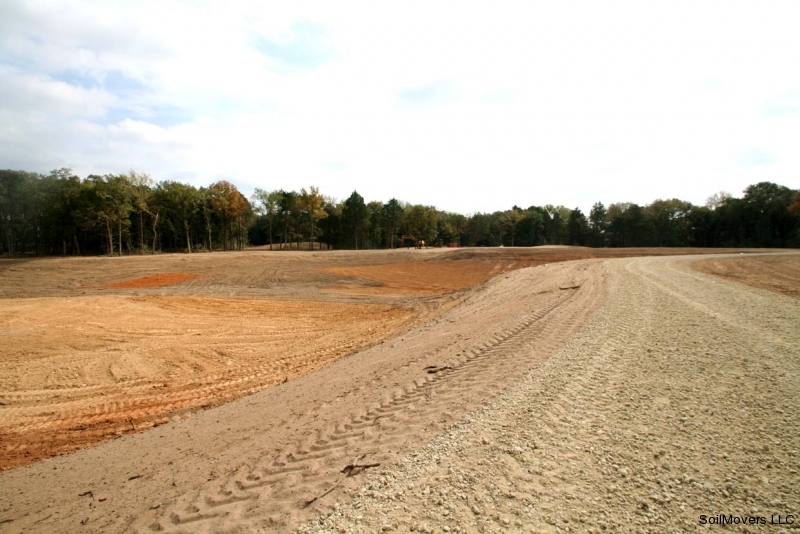 Unsuitable soil was removed and replaced with the correct heavy clay soil to withstand massive water flow. 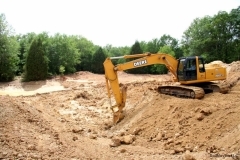 Large area being excavated at property entrance location to remove unsuitable soils. 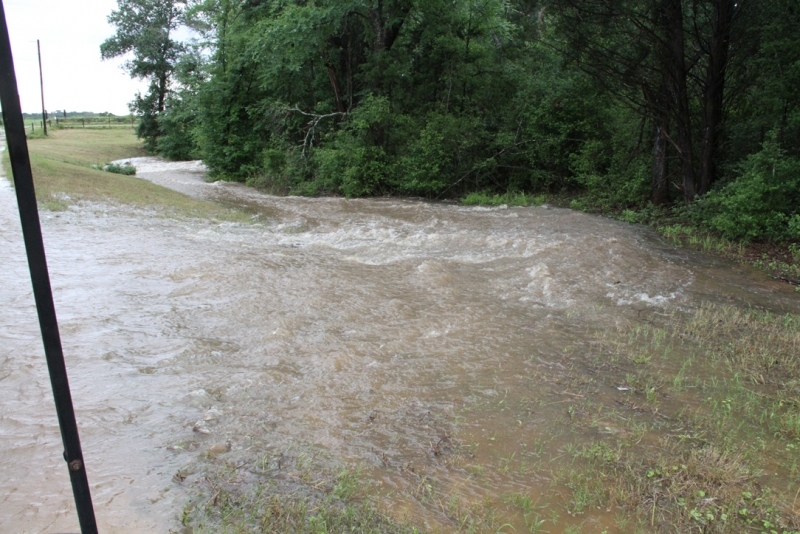 The crossing over a creek was improperly done to start with and this was the only access available to the property. 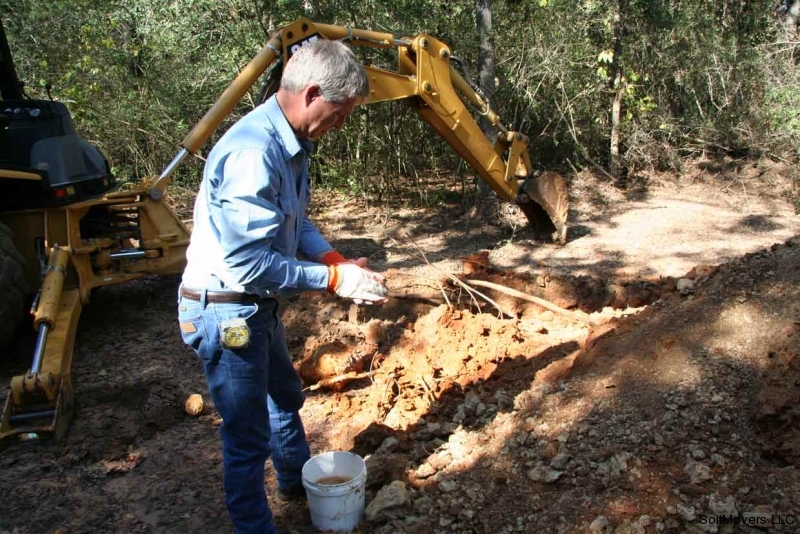 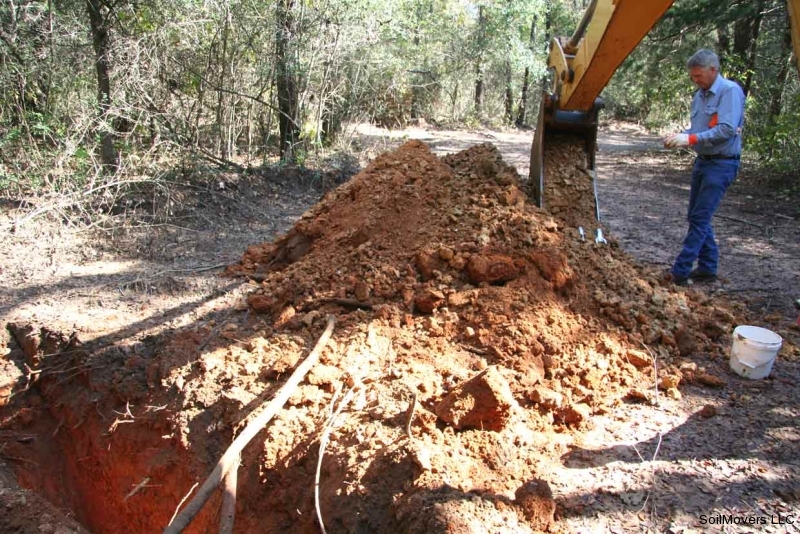 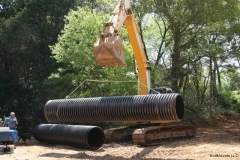 Remove old small culvert pipes which were not adequate for water flow. 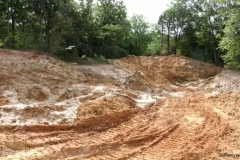 The soil used as fill was also unsuitable and was washing out badly. 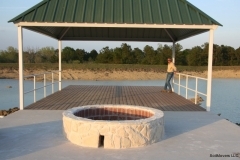 The original entrance was a complete failure and expensive to correct. 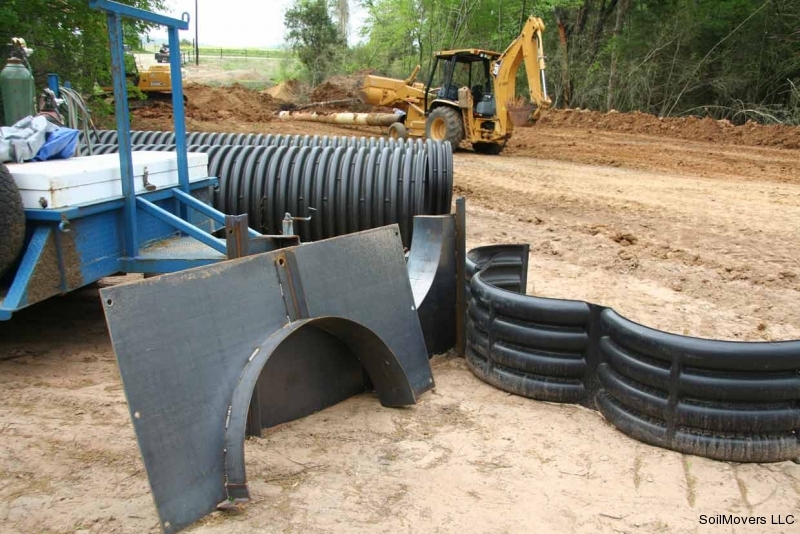 Anti-seep collars & connecting bands for 36" HDPE culvert pipe (high density polyethylene). 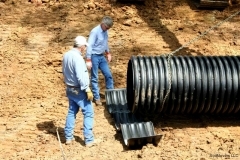 The collars prevent the onrushing creek from ashing out around the culvert pipes and eventually causing the driveway to fail. 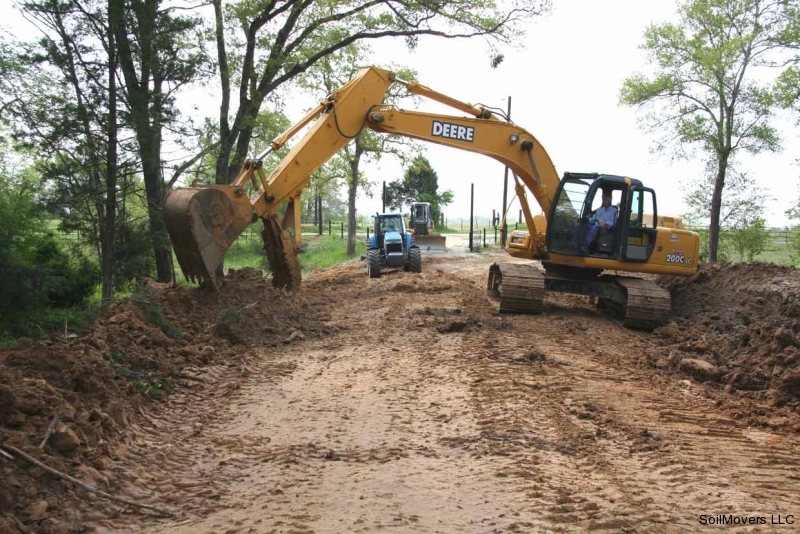 It may seem an inordinate amount of time and money was spent on correcting this entrance. The past failures where access or egress on the property was impossible dictated major corrections. 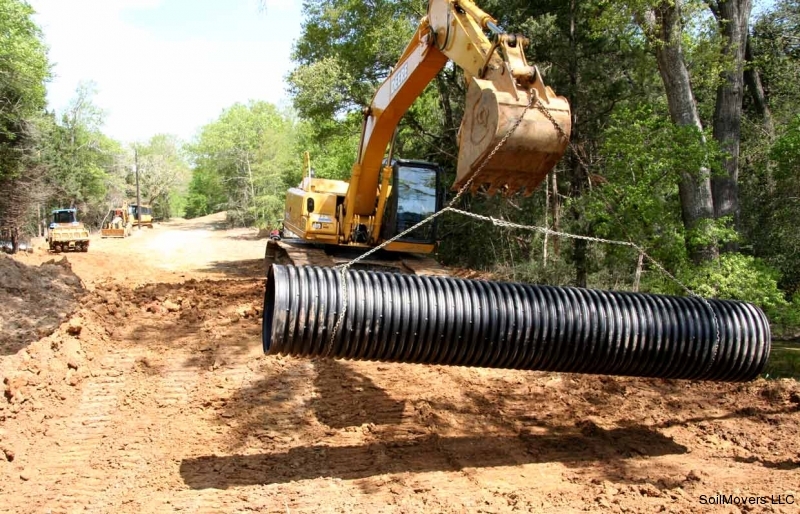 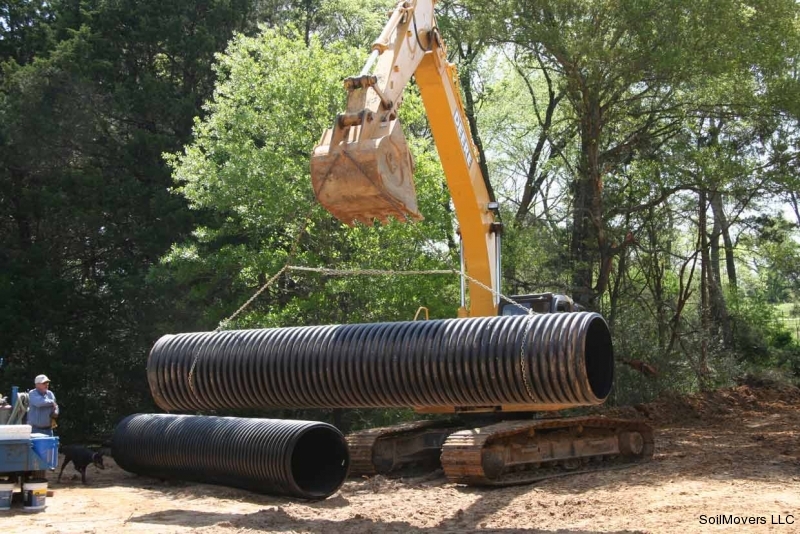 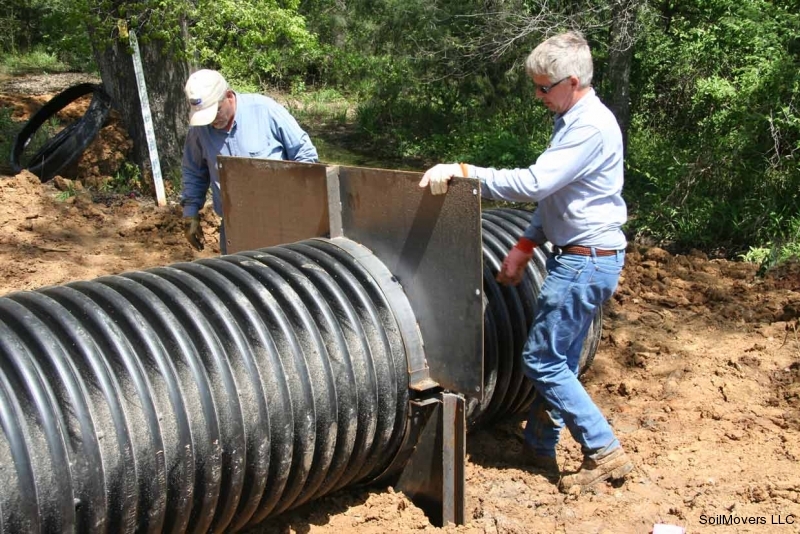 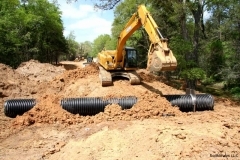 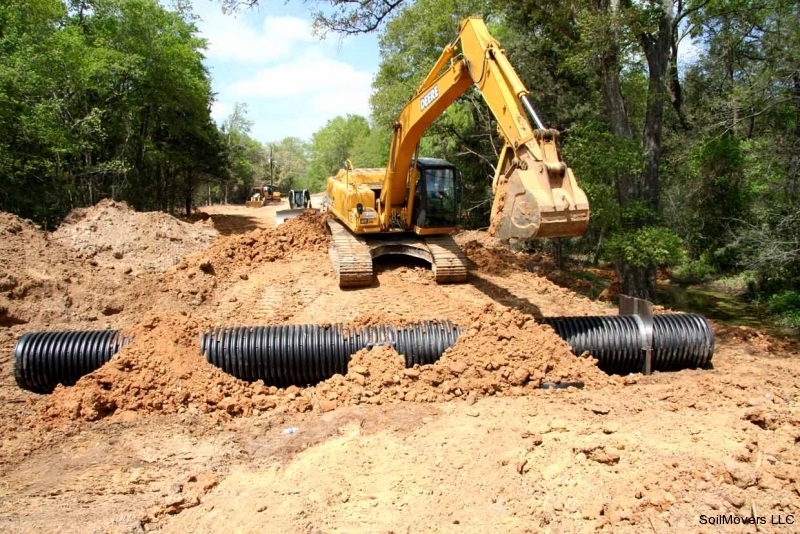 Proper equipment is necessary to install these large culverts correctly. 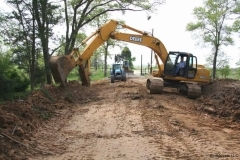 Many contractors cut corners when they do not have the right equipment for the job. 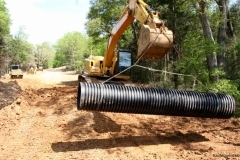 Band used to connect two 20' pipes. 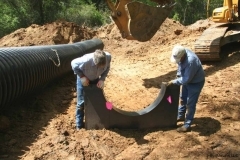 Setting base of custom fabricated steel anti-seep collar at correct elevation. 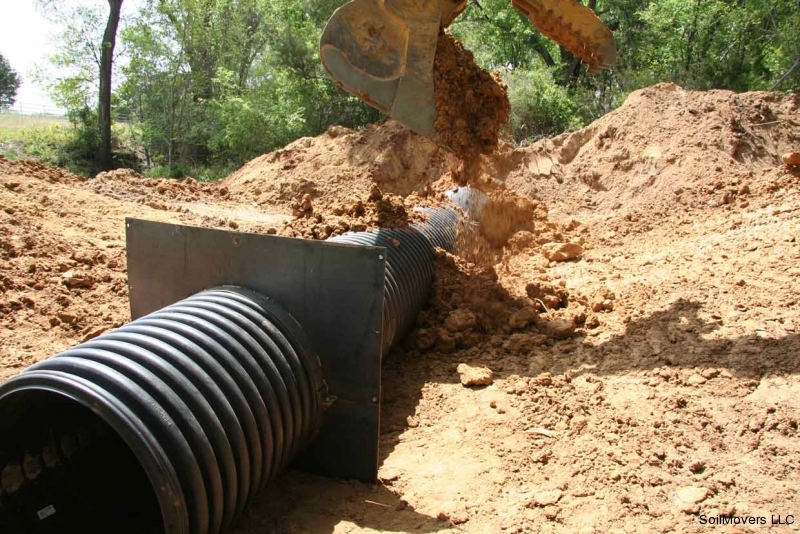 Anti-seep collars prevent erosion around the drainage pipes that could lead to catastrophic failure. 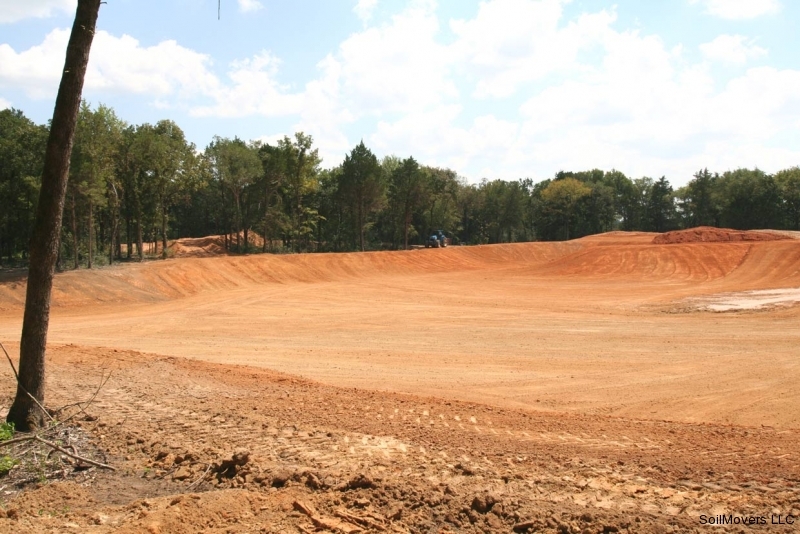 This area flowed a high volume of water and no corners were cut during this phase. 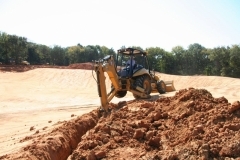 Care in setting the pipe at the correct elevation and the correct base soil insures success. 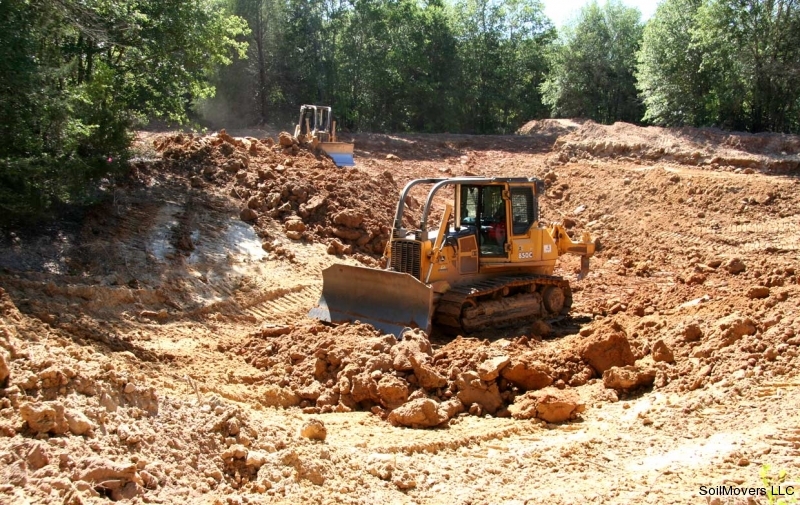 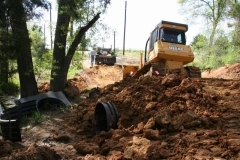 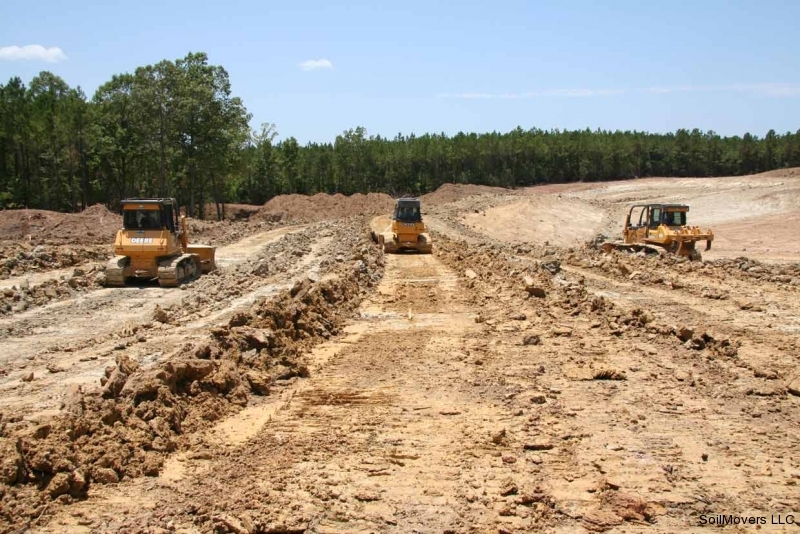 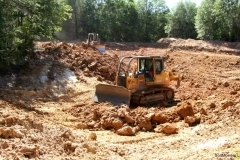 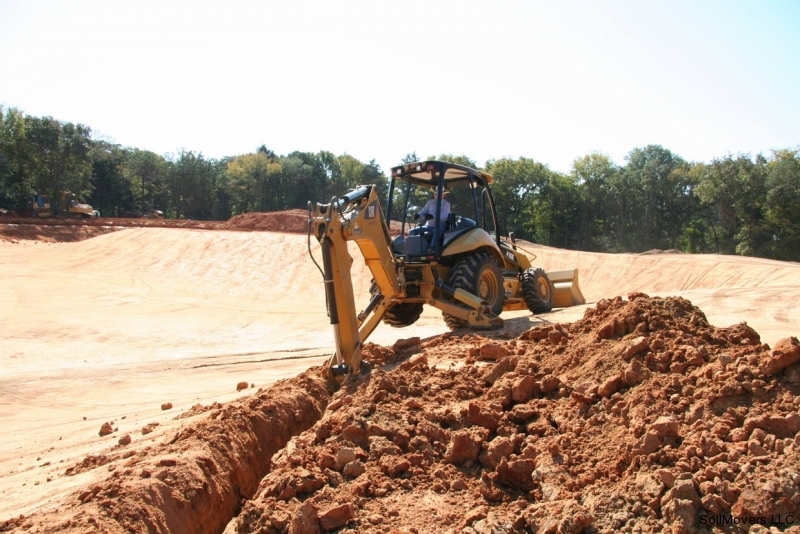 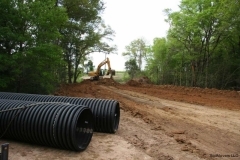 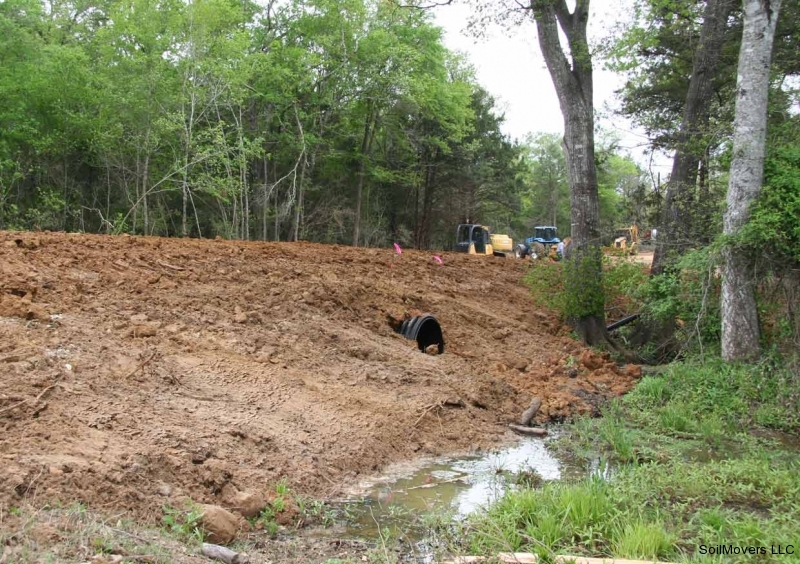 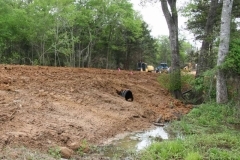 Proper soils and compaction are crucial for a successful culvert installation. 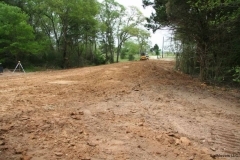 Driveway is widened and power line right of way cleared. 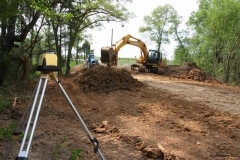 Driveway is elevated several feet to insure integrity and improve the overall look. 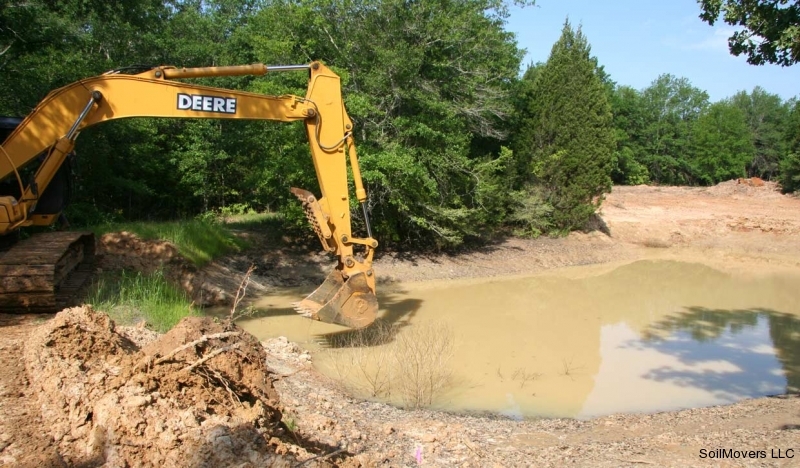 A small existing pond that leaks being drained for repairs. 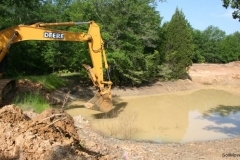 The pond will be expanded in size and deepened. 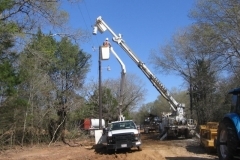 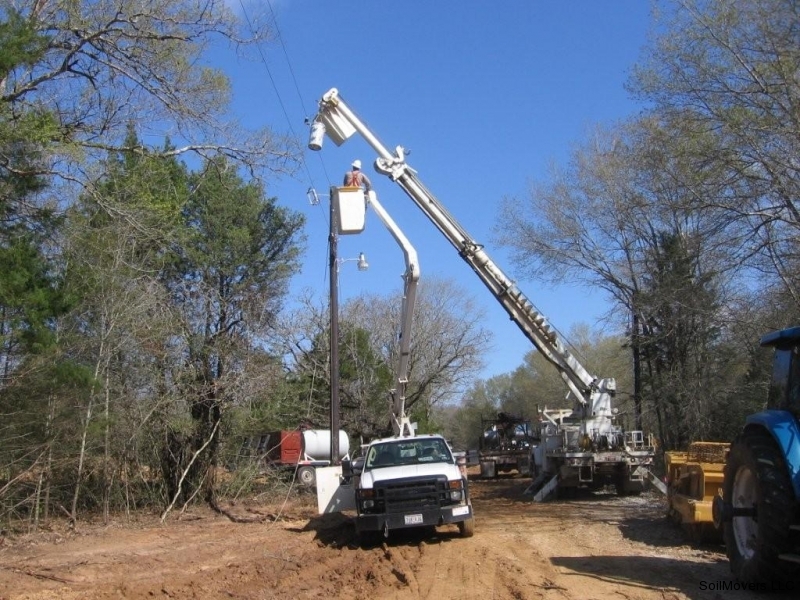 Electric service is established in preparation for the new home construction. An excavator digging for depth is more efficient and economical than a bulldozer in this application. Saves time and money for the landowner. 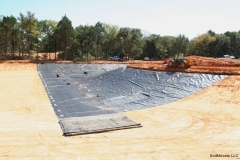 The material excavated from the leaking pond is used to construct the new driveway to save money and fully utilize resources. 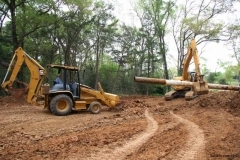 The driveway was excavated to remove unsuitable soil and the proper material is hauled in from the pond excavation. 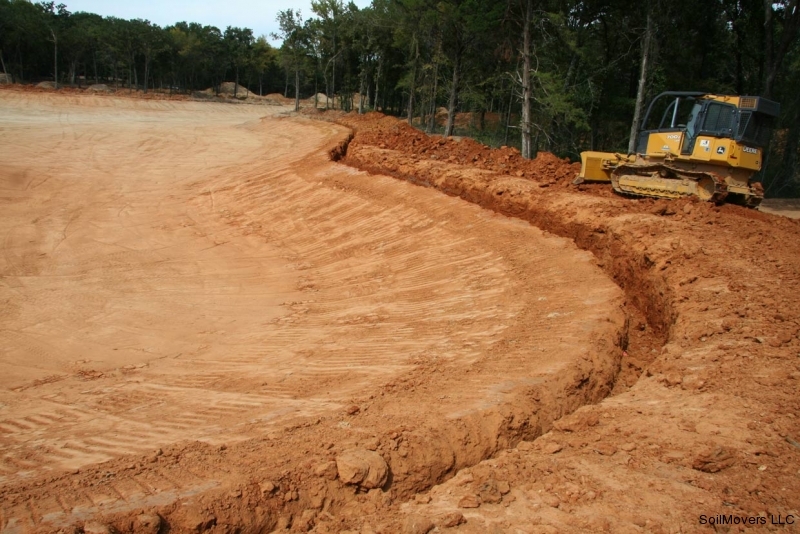 The old pond leak was 'repaired' with bentonite clay by another contractor. The fix was costly and not effective. 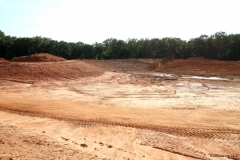 The repaired pond is plated and sealed with 24" of high plasticity clay which was excavated from another area of the property. 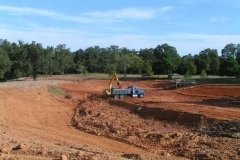 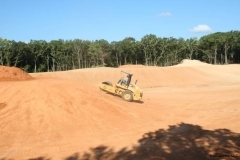 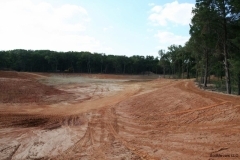 Slopes and steep banks were corrected during the pond renovation. 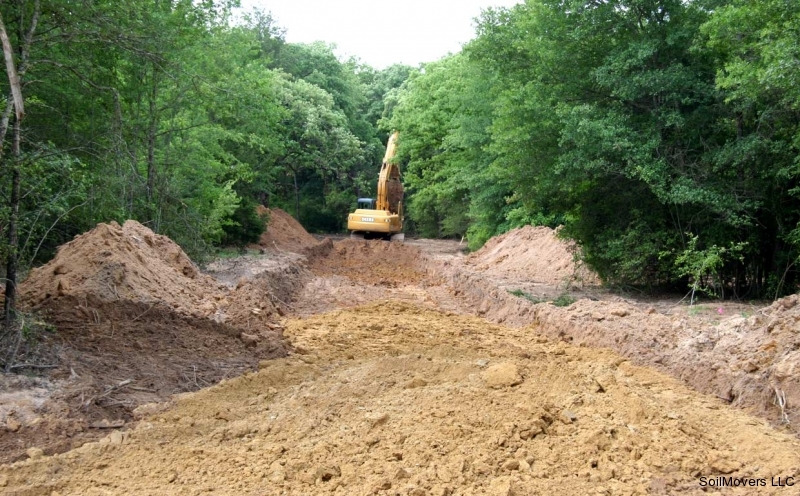 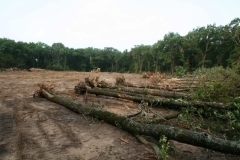 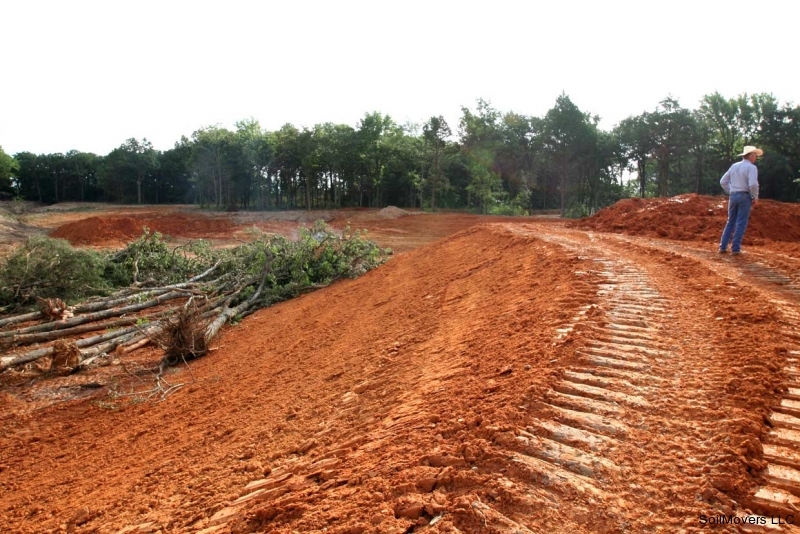 A large tract of hardwood and Cedar trees must be removed to make room for the future lake. 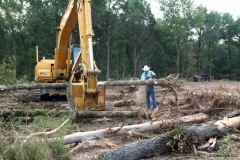 The owner requested us to save the larger trees so they could be sawed for lumber at a later date. 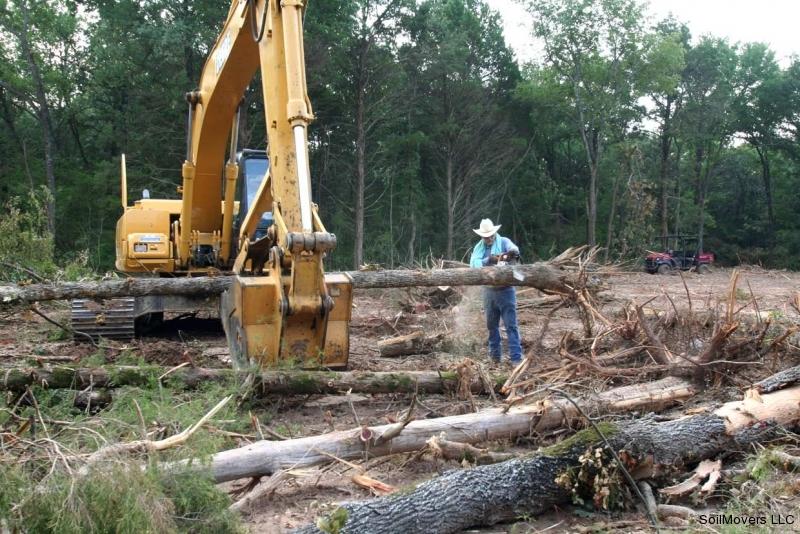 The stumps and tops were removed from the saw logs. 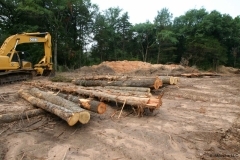 Saw logs stacked for skidding to a central location away from lake construction. 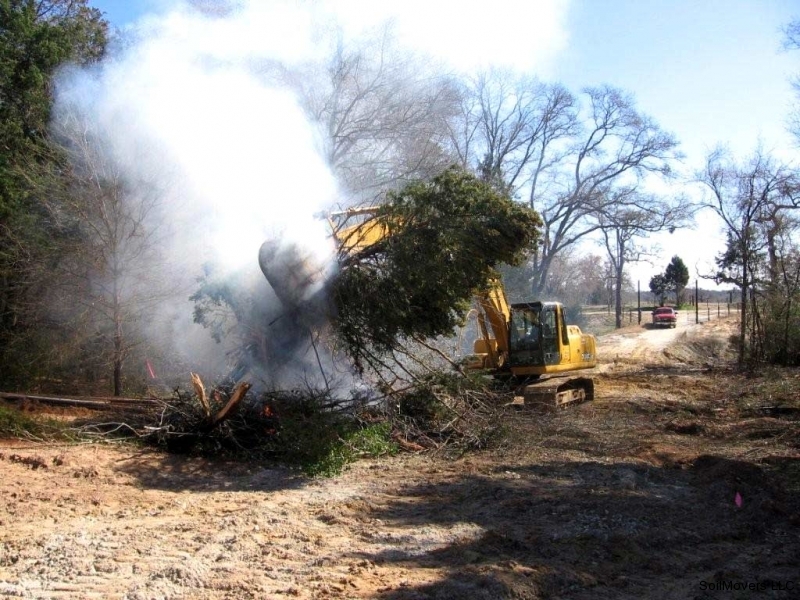 The tops and stumps are burned. 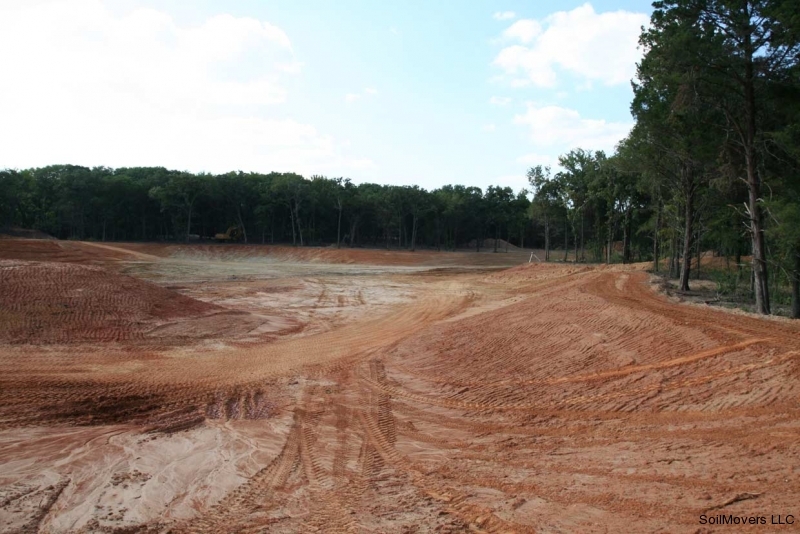 Lake construction continues at a steady pace as the trees are removed. 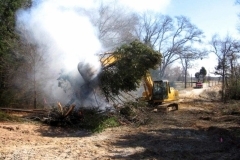 The last of the logs are cut and brush burned in the lake bottom. 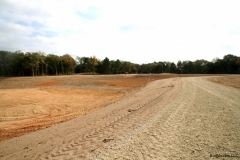 Looking north along the long axis of the new lake. 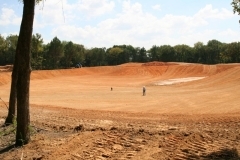 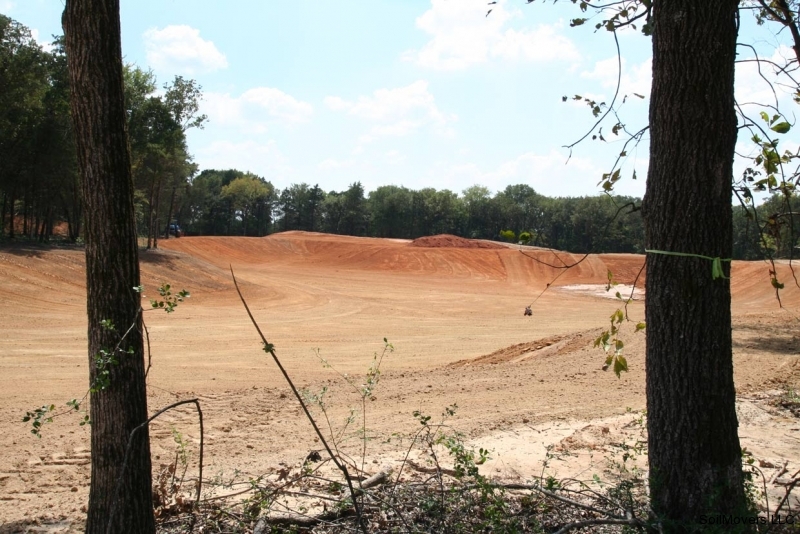 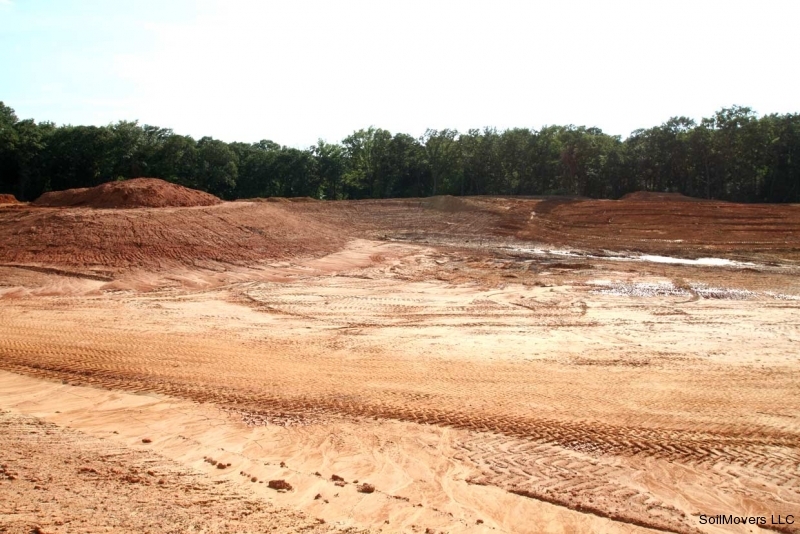 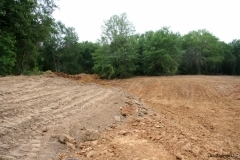 The same view after additional soil has been removed to add depth to the lake. 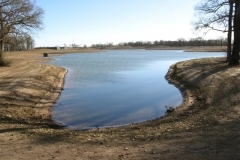 Looking south to the dam. 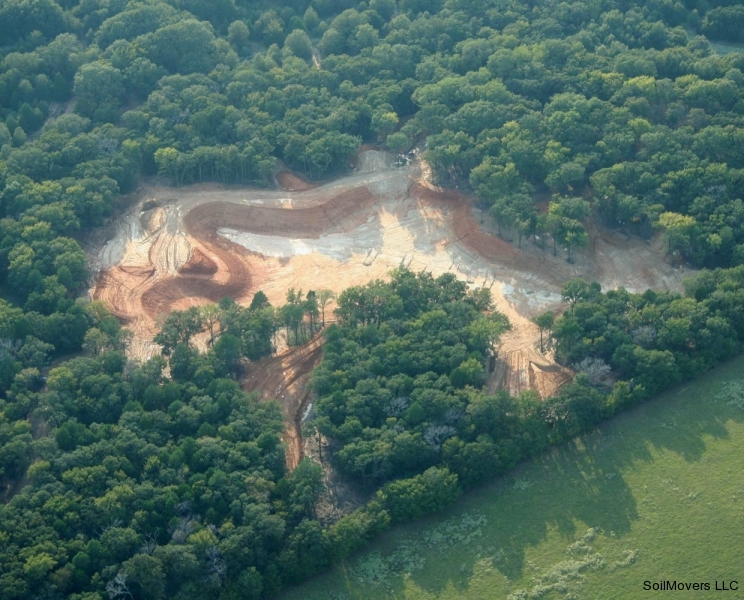 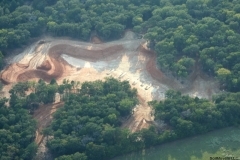 Aerial view showing excavation area ready for liner application, Notice in this and the following pictures how the lake appears to fit naturally into the landscape. 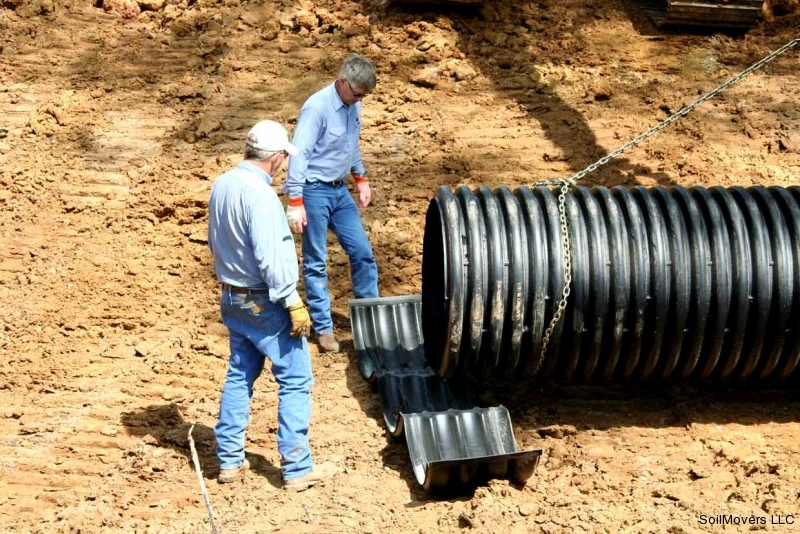 There is no substitute for experience. 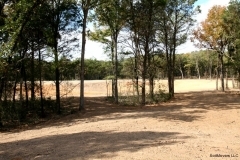 Approximate view from the future residence location. 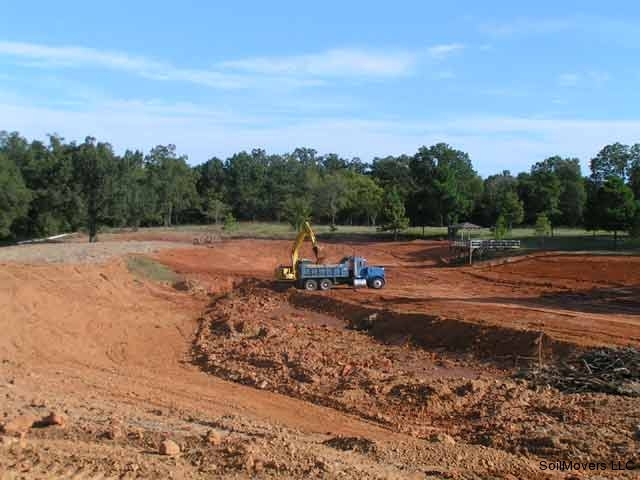 Nick surveys the bottom of the lake -- a good look at the perspective of the size and depth of this large lake project. 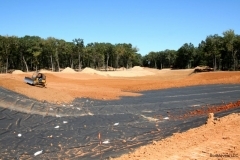 Rolling the surface is the final chore before liner installation. 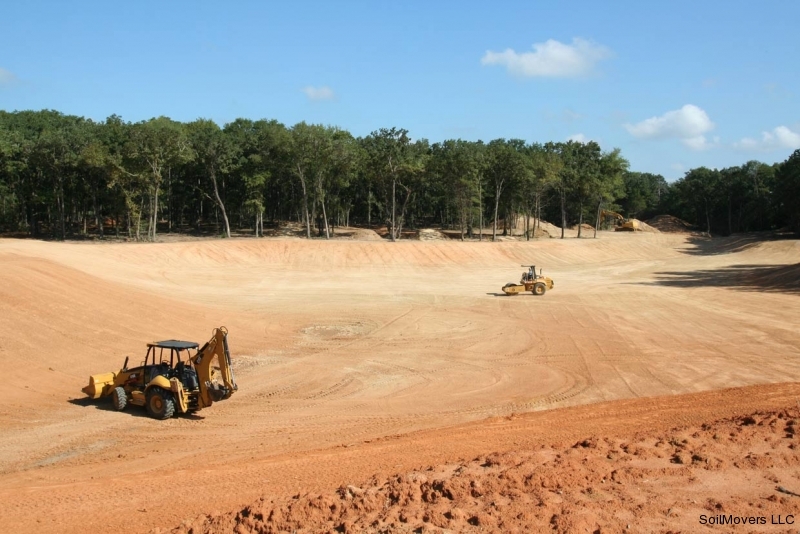 Large equipment dwarfed by the scale of the lake. Anchor trench for the plastic lake liner is dug around the complete circumference of the lake. 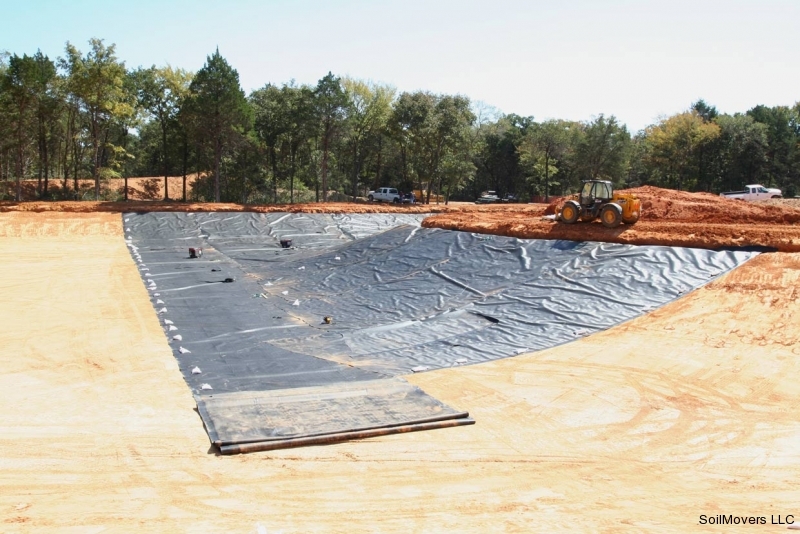 The outer edge of the plastic liner will be placed in the trench and the trench will be filled with soil. 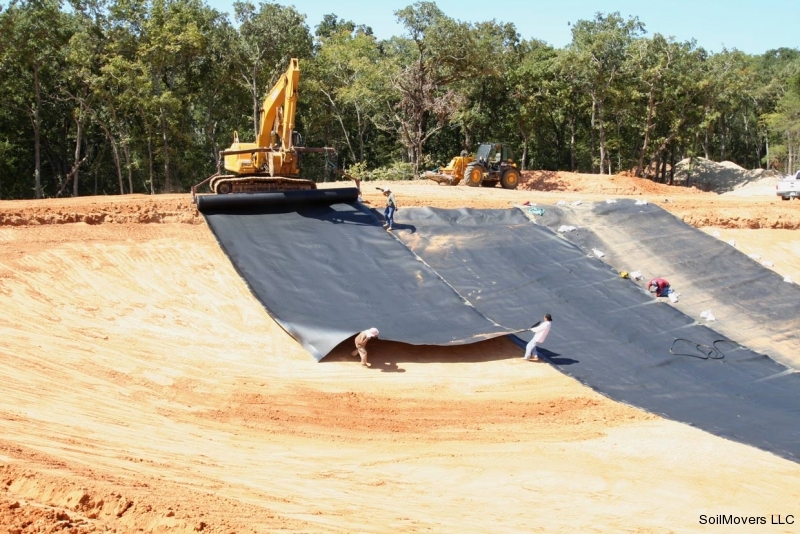 This will anchor the plastic lake liner in place permanently. 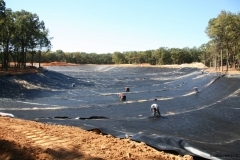 The installation of the plastic lake liner by a professional liner installer. 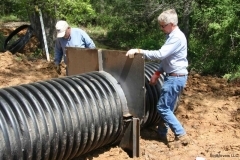 Nick was onsite at all times to oversee the installation was done correctly. 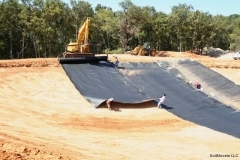 The sections of plastic lake liner are rolled out and the seams are permanently welded together. 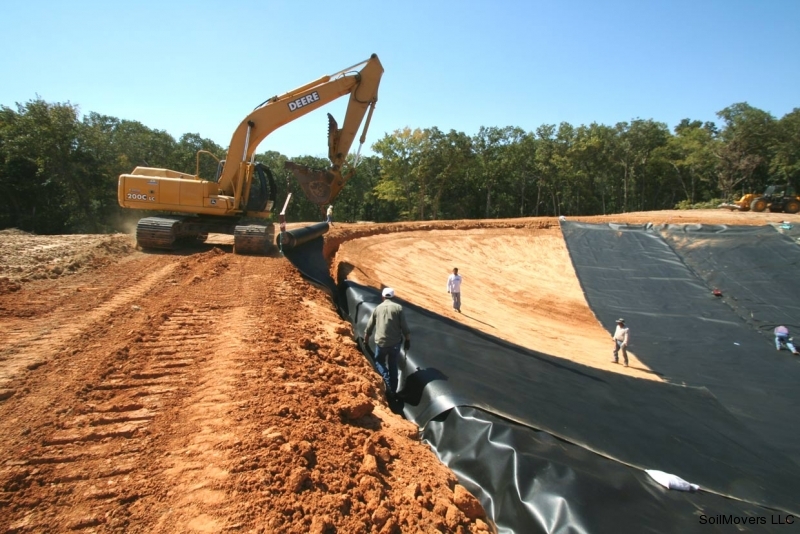 The edge of the plastic lake liner in the anchor trench. 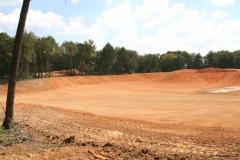 The lake liner nears completion. 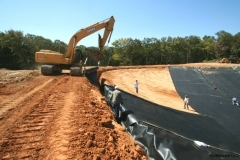 Plastic liner panels being seamed together. 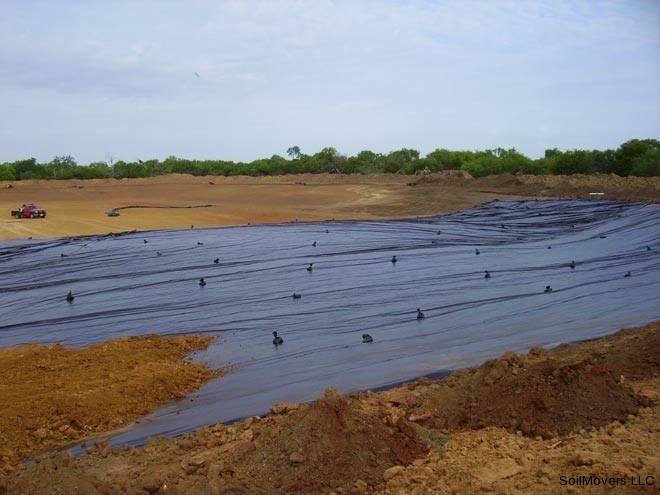 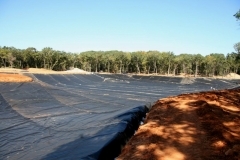 Several inches of cover dirt is meticulously placed on top of the plastic lake liner to permanently fix it to the lake bottom and protect the liner material. Final grading of the adjoining lake area in preparation for seeding. 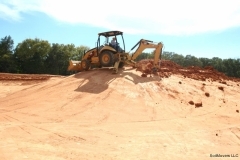 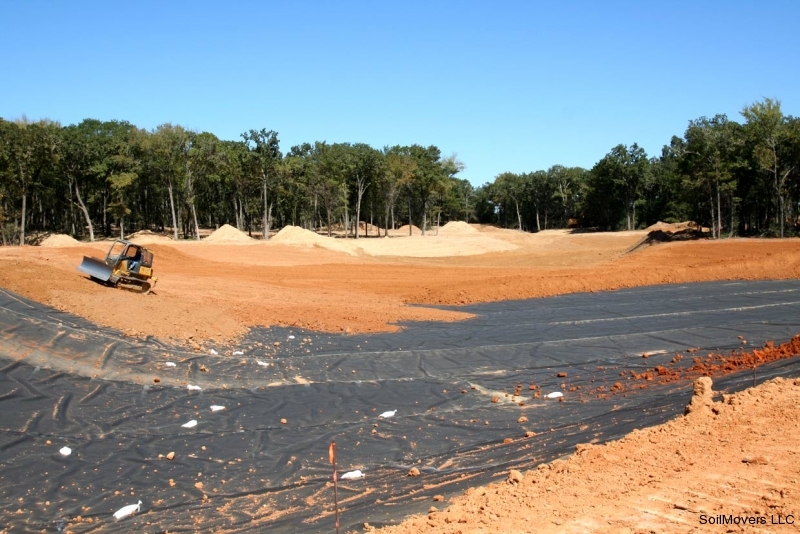 Topsoil which had been stockpiled since the initial phase of the excavation is carefully placed to provide the best seed bed for the new grass. 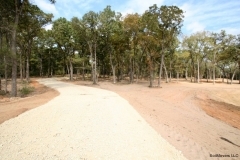 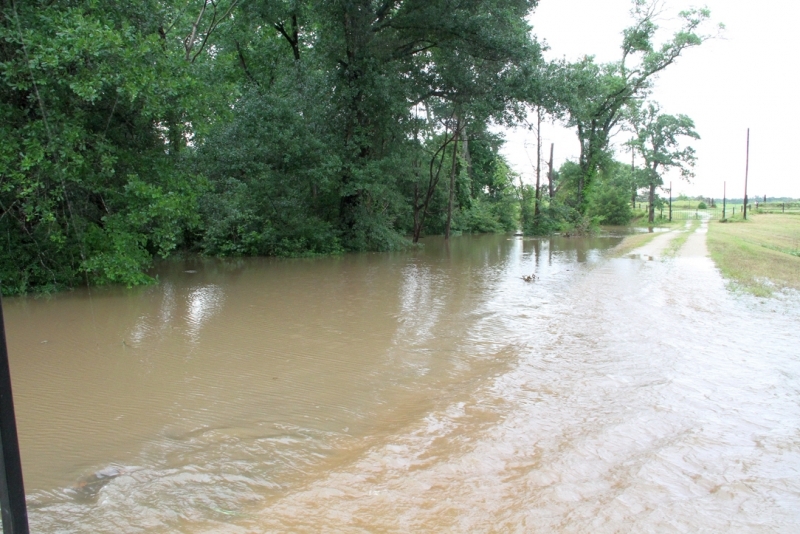 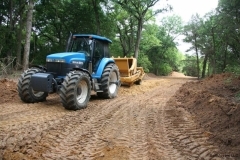 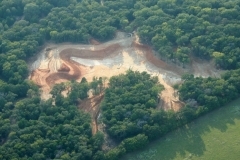 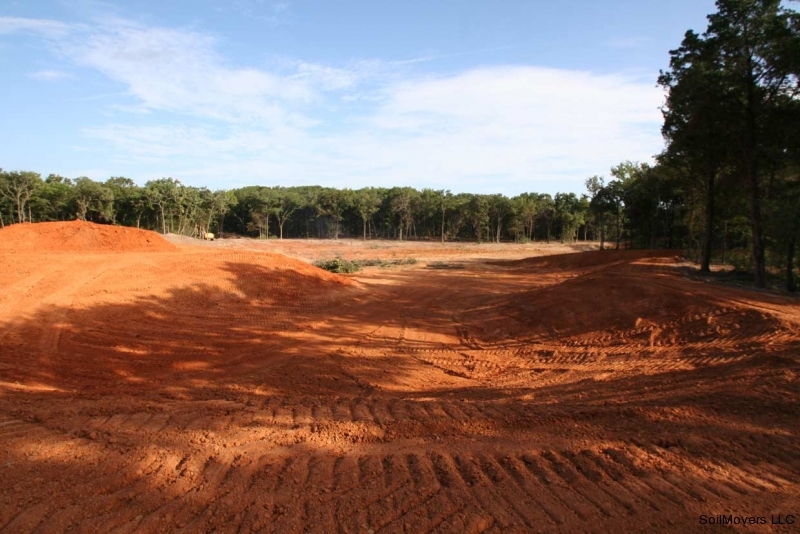 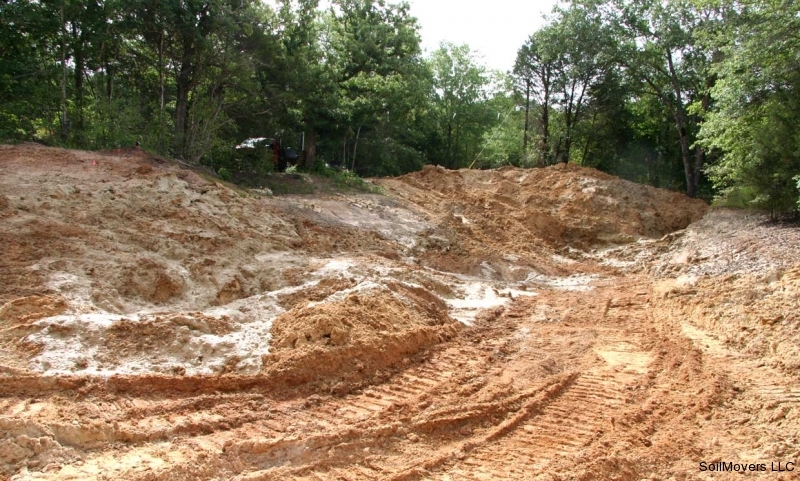 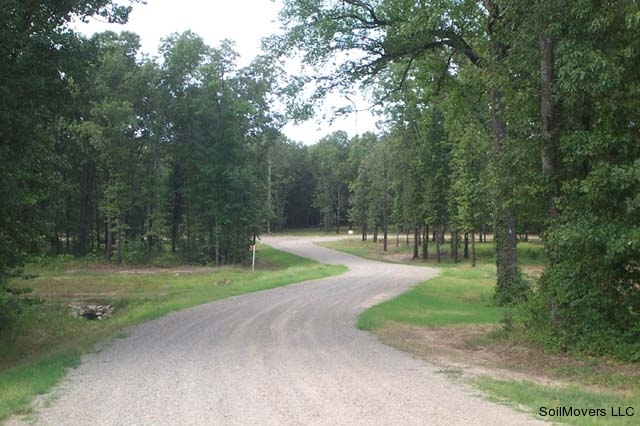 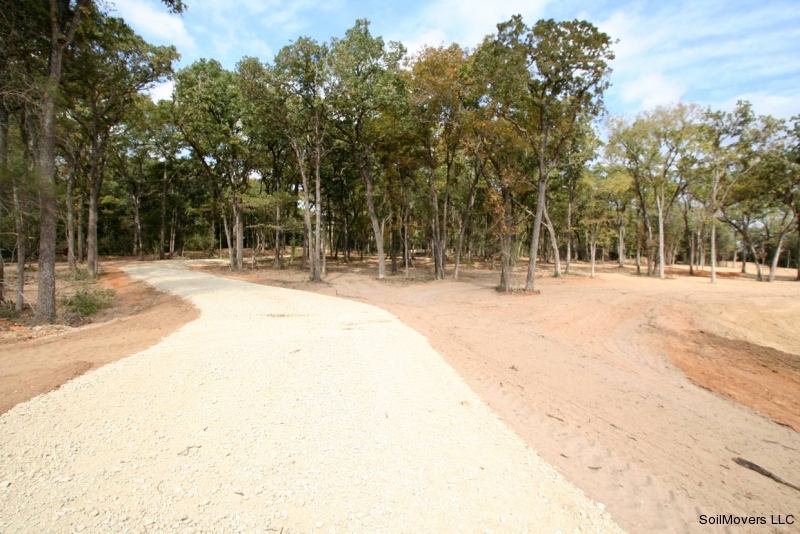 A gravel road is constructed to the owner's future home site on the bank of his new lake. The view of the lake and home is gorgeous as the driveway traverses the dam. 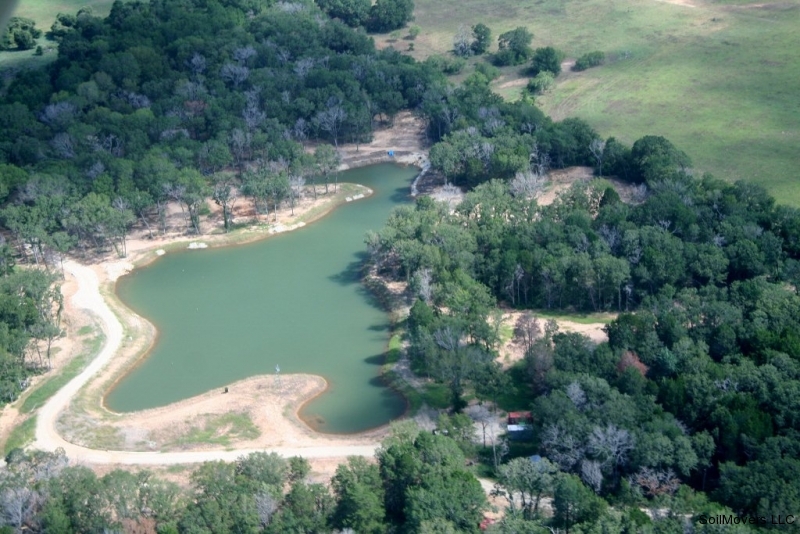 As of 7/12: Water clarity -good The lake is almost full. 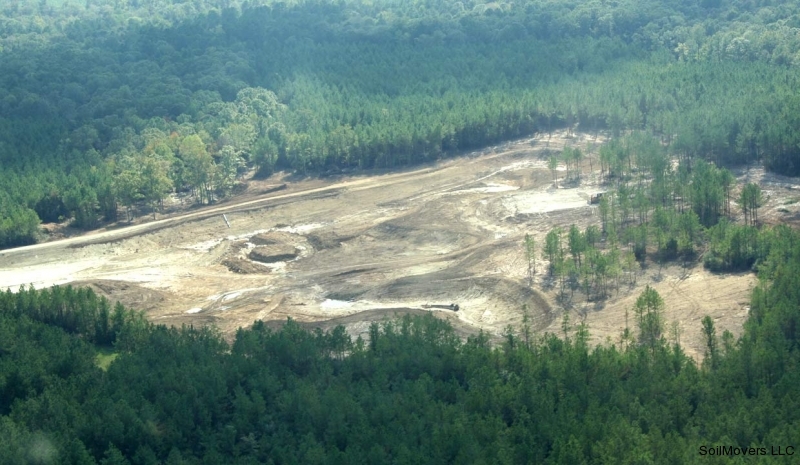 Many dead trees from previous year's drought are seen in the photo. 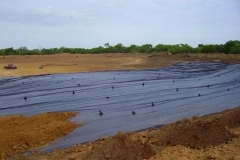 Establishing grass slowly due to the lack of rain. 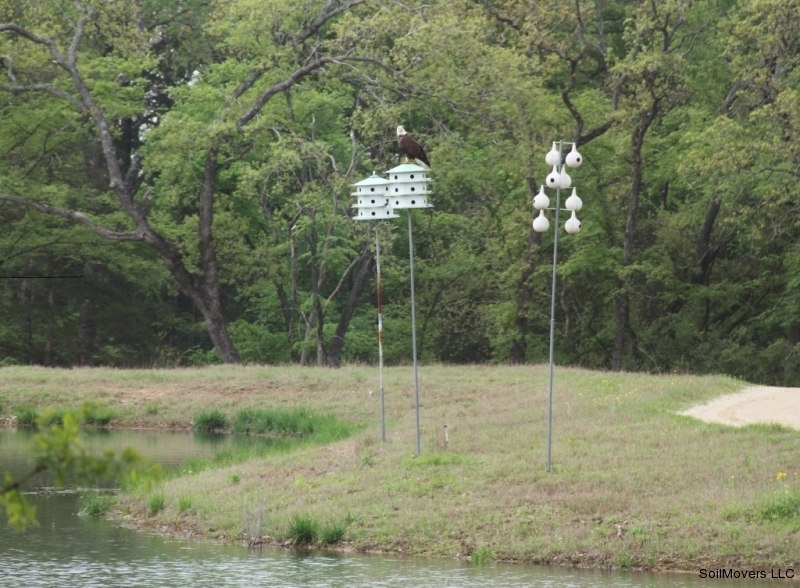 Purple Martin houses along the shoreline. 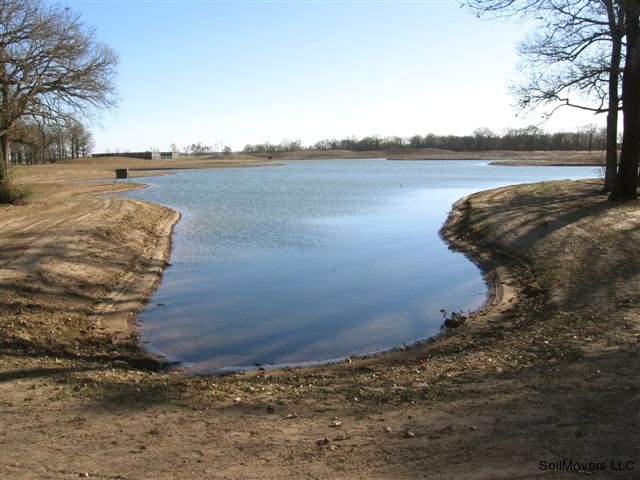 The owner wondered why he had no Purple Martins. 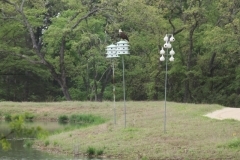 Think this Bald Eagle has something to do with that?? 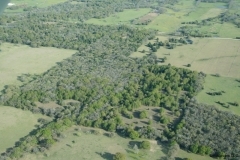 May 2105. 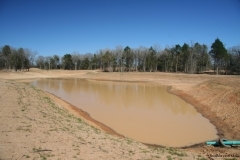 (client pic) The results of 4" of rain overnight. The emergency overflow of the entrance works as engineered. The culvert and actual creek are 30 yds beyond where this picture was taken. 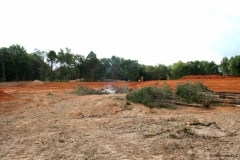 May 2015. (client pic) The emergency overflow inconvenienced the client for just a few hours until the water receded. 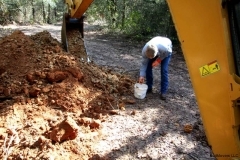 He reported the gravel in the driveway was little disturbed after the event! 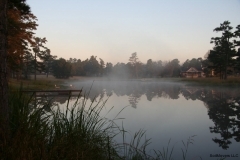 Sound engineering and experience count.